Finding the right winter jacket is essential to an enjoyable and bearable winter season so shop for quality, not quantity. It is better to have one or even two reliable, winter jackets that keep you toasty warm when you’re out and about rather than a collection of mediocre jackets taking up space in your closet. With varying climates, an ideal winter jacket for the west coast of Canada may be very different compared to an ideal winter jacket for the east coast of Canada so keep in mind not every jacket is ideal for every climate. The west coast of Canada can be more damp with more mild temperatures during the winter seasons whereas the east coast will be drier and have wicked, frigid temperatures. Wherever you are this winter, you want to ensure that the jacket you are choosing will perform well in that particular region’s climate. What is a Winter Jacket? A winter jacket is generally a jacket that has extra insulation and a slightly longer fit in order to protect your body from the sharp, winter weather. These jackets are designed to keep your body warm and to provide enough insulation to be worn as a single garment in all winter conditions. A winter jacket will have the necessary features to combat against all the elements you may experience over your winter season including snow, sleet and icy winds. What Kind of Winter Jacket Do You Need? There are three main types of winter jackets so, in order to pick the best one for you, you need to decipher what types of activities you plan to be using this coat for. Do you need a jacket for cruising around town to and from work or are you looking for something to wear while shredding the slopes? The below jackets are the types of styles that you should look for if you are looking for something to wear on the ski hill or for other outdoor activities like ice climbing or mountaineering. Most styles are designed for skiing and snowboarding, but brands like Arc’teryx and Norrøna have other technical options that are suitable for a variety of activities including ice climbing and mountaineering. These jackets will include more technical features such as helmet-compatible hoods and offer better ventilation like pit-zips for high-intensity activities where sweating may be occurring. Generally, technical jackets are more lightweight than a casual around-town winter jacket and will be more compressible and pack-able. They are often 3L jackets meaning they are designed to provide utmost protection is the wettest and harshest winter elements. Most often 3L jackets are waterproof shells crafted with GORE-TEX® membranes that work best as the top layer with an adequate layering system. A technical ski or snowboard jacket will boast features that make them particularly more appealing for active adventurers where weight and pack-ability are essential. The Canada Goose Rossclair Parka and the Nobis Yatesy Down Parka are ideal if you are living somewhere in harsh, winter climates. Both of these winter jackets are ideal for those looking for something to wear while you run into town to do your errands or to keep warm while watching your kids’ soccer games on the weekend. Casual, around-town winter jackets will be slightly more stylish and have more comfort features such as a larger hood, sometimes a fur trim on the hood and lined, handwarmer pockets. Technical features are not necessarily all that necessary for these particular garments because they are not being used for high-intensity activities. The key characteristic for casual, around-town winter coats is superior warmth. Brands like Quartz Co., which has products that are manufactured here in Quebec, are designed for extreme, winter conditions. These brands take into consideration that although style is important when your winters hit as hard as they do on the east coast, a warm winter coat is essential. Some jackets look and perform great on the slopes and around town! These jackets will include a mix of features allowing them to be functional for your winter activities but still look sharp enough to hit the town. The models listed below are designed for long days on the mountain but thanks to their down and PrimaLoft insulation, they are warm enough to wear out around town if you’ve forgotten your parka at home. The Triclimate is a special model that provides three jackets in one. You can choose to wear the two jackets together to get optimal warmth and weather protection, or you can choose to wear each separately if the weather is appropriate. This particular jacket can be used in the winter months but be wary that you may need to add a few extra layers underneath should the temperatures really plummet. These jackets can be fitted with stylish features like buttons and a fur trim on the hood or they can be more of a relaxed fit with easily accessible pockets and a built-in goggle-wipes in a forearm pocket. Everyone will have their own idea of a perfect do-it-all winter jacket because not everyone will have the same needs. In general, these jackets will be waterproof and hold up against the elements on the mountain and be warm enough to romp around town in with just a shirt underneath. What is the Difference Between Down and Synthetics? There are two main types of insulation found in winter jackets; down and synthetic and recently, milkweed insulation has been introduced to the market and is performing impressively. Milkweed is an insulation that holds exceptional thermal capacity, comes from a 100% renewable and plant-based source and is not hypoallergenic. Each type of insulation will have their benefits as well as their setbacks so it is best to be aware of this information so you ensure you are purchasing a winter jacket that will meet your needs. Down is going to be the most lightweight and compressible insulation on the market so if weight and size are an issue for you, you want down. Keep in mind when shopping for a down, winter jacket that this particular insulation is not meant for damp conditions. If you spend your winters in a dry, cold climate, a down jacket will perform at its full potential and keep you protected from the elements but if you are somewhere with a climate like the west coast of BC, your down jacket may not be so perfect. When down is wet, the feathers will clump and lose a lot of their insulation properties and loft. In most cases to have the jacket return to its original self and restore its loftiness, the jacket must be dried properly with a drying machine or laid out carefully in a dry place. If down doesn’t sound so appealing to you, you’ll be thrilled to know that there are a variety of synthetic insulations that are making a name for themselves as well. Although synthetic insulation is generally bulkier and weighs more than down, it generally has a lower average price and can withstand wet climates. If you want to wear your winter jacket worry-free and not be concerned about a change in the conditions, synthetic is the way to go. Will it be Weatherproof Enough? Picking a winter jacket isn’t just about the way it looks but also how it will perform. Sure the jacket may look great and fit perfectly but will it actually keep you warm and dry when you need it to the most? In order to perform well in all conditions, the winter jacket must have a weatherproof outer shell whether it be waterproof or have been treated with a DWR coating. The outer shell of a winter jacket is your protection from the elements so you want to make sure it is adequate for the region you live in. 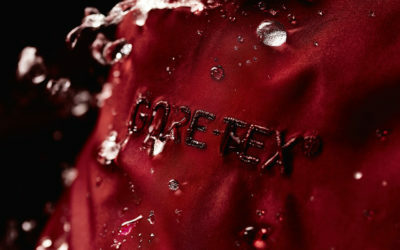 Jackets with a GORE-TEX® outer shell will be the most weatherproof and stand up best in wetter climates. If you experience wet winters with milder temperatures and lots of rain and slush, a winter jacket with a GORE-TEX® outer shell will be your savior. Winter jackets that have a DWR coating will still hold up well in wet weather but will not be as reliable as a jacket crafted with a GORE-TEX® membrane. If you are living in a region where the winters are cold and snowy and you don’t see too many wet, slushy days, then a jacket with DWR coating should do the trick. A large portion of our body heat escapes from our head so almost always winter jackets will conveniently include a hood. For whatever reason, if there is no hood, it is best to keep a winter hat like a toque close by to throw on when it is needed. Wearing a hood not only protects you from the rain, wind and snow but will also help keep your body warm while you’re out in the winter weather. Ideally, you want a jacket that has an adjustable hood. This means it will be equipped with toggles so that the hood can be cinched tight and stay on your head when the winds pick up. A lot of technical winter jackets will have removable hoods so if you are layering over a jacket that already has a hood, you can zip off the hood on your winter jacket to eliminate any excess bulkiness. When you are searching for a winter jacket for winter sports, you may want to search for one with a helmet compatible hood. Whether you’re hunting for a casual, around town winter jacket or a more technical winter jacket for winter sports, pockets are practical. Having secure, convenient pockets will make a winter jacket organized and user-friendly. Look for a jacket with an audio compatible, internal pocket allowing you the ability to cruise around while jamming to some great tunes. This pocket can also be a safe spot for your important cards when your wallet is too big and bulky to bring up on the hill. For someone looking for a more technical winter jacket for ice climbing or backcountry skiing, pocket placement and depth are crucial. Having accessible pockets that are big enough to hold all your necessary gear can be a selling point. *To learn more about other technical features found on winter jackets such as taped seams and laminated zippers check out Altitude-Sports’ guide to raincoats. For some, winter is about dressing to impress and looking good around town and on the hill. Part of looking good, is feeling good so make sure your winter jacket is a right fit. If you’re on the hunt for a winter jacket to wear around town you can get away with a form-fitting winter jacket that will provide the warmth you need. But, if you’re searching for a winter jacket for on the hill, you need room for layers. Throw on a few extra layers when trying on your winter jacket so you can get a real feel for what it’s going to be like. Try on the next size up from what you generally choose and compare the sizes. If you reach your hands high above your head, is your torso still covered by the jacket? Do the arms feel tight when you give yourself a big hug? Picking a proper fitting winter jacket will keep you comfortable and warm this winter season. Not every jacket is going to fit perfectly so take some time to try on a few different styles and see what works for you and what feels the most comfortable. Make sure you’re winter ready this season. Shop smart and pick a winter jacket appropriate for your needs. You’ll be yearning for the first sign of snowflakes in the forecast so you can test that baby out. There is 7 thoughts on this article titled “How to Choose the Right Winter Jacket”. Who is the designer of the coat in the main photo? What about folks that work outside on winter. You don’t even discuss this. Hola, lo sentimos mucho, Altitude-sports es solamente una tienda on-line con una tiend en Mont-Tremblant, QC. Usted puede devolver el abrigo si la talla no es la correcta, y siempre puede hacer otra compra con la talla correcta. Sin embargo, recuerde que existen cargos por los envios de devolución.